The story opens with the introduction of 11 year old Arlen, who goes to the nearby village with his parents to help clean up and repair what they can after a demon attack leaves dozens of villagers dead. While there, a Messenger comes from the Free Cities and Arlen learns that people once fought the corelings, demons that rise from the core of the earth each sundown to wreak havoc on the lives of mankind. Arlen tires of cowering in fear behind warded walls so when tragedy strikes his own family, he sets out alone to follow the Messenger, who braves the night with portable wards. Next, we meet 13 year old Leesha, who aspires to become a woman so that she can marry and get away from her oppressive and abusive mother. After a demon attack on her own village, the life she thought she would have crumbles to dust and she becomes apprenticed to the local healer. Finally there is Rojer, who loses his parents to a coreling attack at the age of 3 and is left in the care of the sole survivor of the attack, a Jongleur who has come to the village with a Messenger. Sadly, his mother may have survived if the Jongleur, Arrick, hadn’t shoved her out of the way to save his own hide. Still, despite his selfishness, he honors her last wish to care for Rojer and so raises and apprentices him. The story follows each of the children as they grow up, over the course of about 14 years. The main focus of the story is on Arlen who was found on the road by the Messenger Regan, shortly after running away from his father. Regan takes the boy home and arranges for him to become apprenticed to a Warder, in order to become adept at that very necessary skill of all Messengers. Regan’s wife grows to love Arlen and blindly hopes that he will stay within the warded walls of the city in order to remain a Warder, marry and have children. Arlen has other plans, however and eventually sets out to see the world. He seeks the ruins of old cities in the hope that he might learn about the people who once inhabited them and how they had fought the corelings. He travels many roads and learns many things before finally meeting Leesha and Rojer near the end of the book. Each of the others have also grown and changed after 14 years, though not nearly as much as Arlen has changed. I’ve seen a few reviews and comments that mention that Brett was trying to move the story along too quickly, skipping months and years from one page to the next which gave the story a rushed feel. I didn’t have this issue with the book, not in the least. I thought that the fast-forward tempo was rather fitting because as the reader, I was indeed expecting this to be the story of a warded man and not a warded boy. I wasn’t left feeling like I was missing anything and despite a rather long section that didn’t feature Leesha at all, I didn’t even feel cheated in regards to her story. Brett did a good job of ‘catching up’ on each character if their plot line had been skipped over for multiple chapters and the story flowed rather well. Also, before I get to the meat of this post, a quick word about the reader. I thoroughly enjoyed Pete Bradbury’s performance and had no trouble whatsoever getting into the story. I’d never listened to Bradbury read and worried that I’d have difficulty getting used to his voice and his style but he was great and I look forward to him reading the rest of the books! Now, the story. The demons. The utter terror that most of the people of this world live under night after night after night. The characters living in constant fear that causes some to freeze when faced with the abominations that rule the night while prompting others to risk themselves to save loved ones or neighbors from an unthinkable fate. The isolation and loneliness experienced by those who live far from the Free Cities accentuates their bleak survival against all odds. The emotions of the main characters… their grief and worry, their defiance and determination… are palpable and it’s as simple as breathing to get completely caught up in their stories. The world, the people and their hopeless plight, the horrors that stalk the nights, the helplessness and desperation that permeate their lives are all painted so vividly by Brett that I was utterly captivated. The story grabbed me from the get-go and I was drawn into this grim world where every single person’s life is ruled by the sun… or rather, by the lack of sunlight. Every chore and errand must be completed by dark. Everything you don’t want destroyed must be safe behind wards when the sun sets. Wards must be checked for wear regularly or a family may wake up to fire demons and rock demons burning and smashing their way through their home… from which there is no escape. For if they were to flee outside, they would only be met by more demons and certain death. Not only do the people live in constant fear, the threat of the demons rules every aspect of their lives. They marry off their daughters as soon as they reach puberty, essentially hoping that they procreate as much as possible. The demons kill so many people that the population struggles to keep up and bearing many children is a point of pride to most women. The people are generally isolated and most that don’t live in the Free Cties only interact with those that live close, in the same village or in close proximity. The only people that regularly travel for days at a time are the Messengers and some people only see one of those once a year. Even in the Free Cities, life is less than ideal and ruled by the presence of the demons each night. Each city relies on the others to provide supplies and food and in turn, has its own commodity to offer to the other cities. Most of the handful of cities are ruled by Dukes and they generally don’t get along very well, arguing amongst themselves over trade and who’s to pay for caravans lost to demon attacks, among other things. There is political unrest aplenty and I suspect that unrest will come to play a bit more in the second book, The Desert Spear. Sprinkled here and there throughout the story are tidbits of the lives of men before they cowered in fear behind warded walls. There are mentions of science. Of machinery. Of a demon war in which mankind didn’t hide from the night but instead fought the demons when they rose from the Core and eventually defeated them, banishing them back to their own world beneath the ground. But then mankind forgot about the demons. About many of the life-saving wards. The offensive wards. And so they were left totally unprepared when the demons began to rise again. A second demon war ensued and mankind was decimated, having forgotten all but the basic defense wards. Three hundred years have passed since the second demon war and mankind waits for the fabled Deliverer to drive the demons from their midst once more. But will he ever come? At the close of the story, Arlen, Rojer and Leesha have decided to spread the knowledge that each has been taught or discovered on their own, to as many people as possible so that others can begin to fight back, rather than hiding behind their wards. Each of them has a deep hatred for the corelings and an urgent wish for mankind to live without fear once more. I’m lucky to have the audio book of The Desert Spear (excerpt here) waiting for me but once I’m finished with it, I’ll have to wait right along with everyone else for the release of book #3, The Daylight War. Let’s hope we’re not waiting for too long. 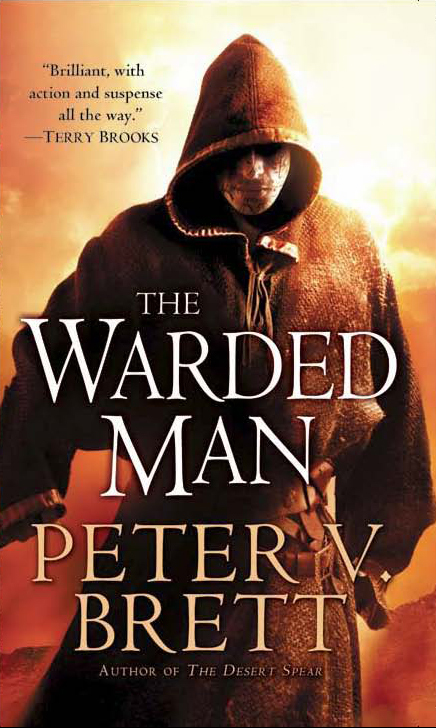 This entry was posted in 50 Books, review and tagged 50 Book Challenge, audio book, book reviews, Demon Cycle, Peter V. Brett, series. Bookmark the permalink. My secret santa sent this to me for Christmas, but I haven’t picked it up to read yet. I will, though, especially after reading your review. My tbr stack is just so high…argh. Thanks for the review and bumping this up my list! Glad to hear it! I hope you like it. I finished book 2, ‘The Desert Spear’ recently and need to get the review finished.